Overall, multiracial adults look similar to the general public in terms of their partisanship, ideology and views about the role of government. But, as with other attitudes and experiences, clear differences emerge among multiracial groups depending on which races make up their background. 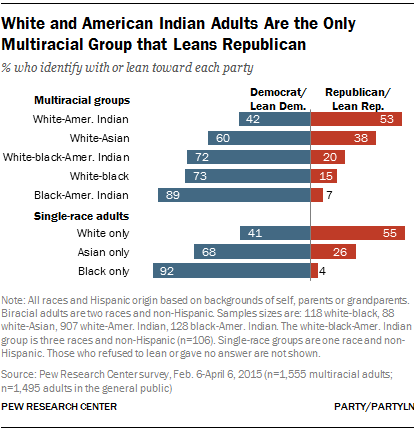 Biracial adults who are white and American Indian—who make up half of the total multiracial population surveyed—are more Republican-leaning and conservative than the rest of the multiracial population, and their viewpoints closely resemble those of single-race whites. At the same time, multiracial adults who have some black background lean more toward the Democratic Party and generally have less conservative views than the general public—closely resembling single-race blacks on these measures. Biracial white and Asian adults also tend to lean more Democratic and liberal than the general public, and their views generally, but not consistently, are more in line with those of single-race Asians than single-race whites. In addition to looking at political identification and views on political issues, this chapter explores multiracial adults’ views on a variety of social issues. For example, when asked about the impact the growing number of interracial families is having on American society, a majority of adults say this hasn’t made much of a difference. Among those who do think it has changed society, about twice as many say it has been a change for the better than say it’s made things worse. Americans are more negative about other changes in the American family, such as increases in single mothers, unmarried parents, and gay or lesbian parents. In terms of their political partisanship, multiracial adults tilt more toward the Democratic than the Republican Party; the same is true of the general public. Some 57% of multiracial adults identify with or lean toward the Democratic Party, 37% identify with or lean toward the Republican Party, and 6% do not lean toward either party. Among the general public, a similar 53% are Democrats or Democratic-leaners and 41% are Republicans or Republican-leaners. Hidden within this leaned identity is a large share of multiracial adults who, when initially asked about their political views, say they are neither Republican nor Democrat. This includes 28% who say they are independents and an additional 16% who say they are “something else.” The share saying they are “something else” is significantly higher than among the general public (10%). Previous Pew Research Center analysis has shown that young adults are less likely than older adults to affiliate with either of the two major political parties. The relative youthfulness of the multiracial population helps explain the high share of mixed-race adults who describe themselves as unattached to either major political party. About half of multiracial adults ages 18 to 29 say they identify as political independents (29%) or something else (23%), similar to the 45% of all adults ages 18 to 29 who say this. However, among those ages 30 to 49, multiracial adults are somewhat more likely to identify as something other than Democrat or Republican (45% vs. 35% among the general public), and this also contributes to the gap in political affiliation. Compared with the general public, multiracial groups with some black background tilt more strongly toward the Democratic Party. Among black and American Indian biracial adults, about nine-in-ten (89%) identify or lean Democratic, while just 7% identify or lean Republican. This closely resembles the partisanship of single-race black Americans (92% identify or lean Democratic, 4% identify or lean Republican). The other two multiracial subgroups with partially black backgrounds are somewhat less likely than single-race blacks to lean Democratic and are at least three times as likely to lean Republican. Nevertheless, their political leanings more closely resemble those of black adults than single-race white adults. White and black biracial adults lean more toward the Democratic Party (73%) than the Republican Party (15%); multiracial white, black and American Indian adults do so by a 72%-20% margin. Some 60% of biracial white and Asian adults identify with or lean toward the Democratic Party, and 38% identify with or lean toward the Republican Party. While they don’t differ significantly in this regard from single-race Asians (68% Democrat vs. 26% Republican), they are much more likely than single-race white adults (41%) to identify as Democrats. Multiracial Hispanics lean more toward the Democratic than Republican Party by a margin of 61%-36%. These views do not differ from those of multiracial adults who are not Hispanic (57% Democratic or lean Democratic vs. 37% Republican or lean Republican). As with party affiliation, multiracial adults on the whole do not differ from the general public when it comes to political ideology. Overall, about three-in-ten multiracial adults (28%) describe their political views as conservative, roughly two-in-ten (21%) as liberal and about half (48%) as moderate. Among the general public, 32% are conservative, 20% are liberal and 45% are moderate. Biracial adults who are white and American Indian are the only multiracial subgroup analyzed in which the balance tilts toward a conservative ideology. Among the other multiracial subgroups, the balance either tilts liberal or is split between the two ideologies. About four-in-ten biracial adults who are white and American Indian (37%) have conservative political views, 18% have liberal views and 44% describe their views as moderate; these shares match closely to those among single-race whites. 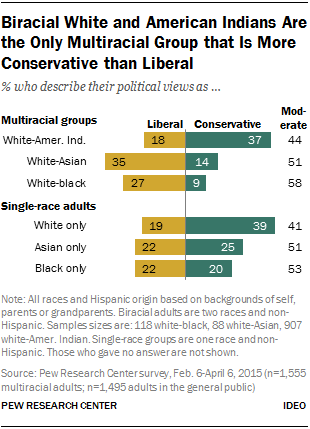 About a third of biracial white and Asian adults (35%) describe their political views as liberal, while less than half as many (14%) describe their views as conservative (and 51% as moderate). This stands in contrast to the conservative leanings among the general public (32% conservative vs. 20% liberal) and single-race whites (39% conservative vs. 19% liberal). Among single-race Asians, the balance of ideology is evenly split between liberal (22%) and conservative (25%). When it comes to political ideology, views are not consistent across the multiracial groups that include a black racial background. Biracial white and black adults lean toward a liberal ideology over a conservative ideology by a 3-to-1 margin (27% vs. 9%), with 58% describing their political views as moderate. This group is about half as likely as single-race blacks (20%), and even less likely than single-race whites (39%), to identify as conservative. The views of multiracial white, black and American Indian adults are more evenly split between a liberal (19%) and conservative (14%) ideology, with 61% saying they are moderate. These multiracial adults are less than half as likely as single-race whites to say they have conservative views, but their views do not differ significantly from those of single-race blacks. Among biracial black and American Indian adults, about a quarter (24%) say they have conservative views, 17% say they are liberal and 59% say they are moderate. Their political ideology does not differ from that of single-race blacks. Multiracial Hispanics are evenly split between a liberal (31%) and conservative (28%) ideology, with an additional 39% describing themselves as moderate. By comparison, multiracial non-Hispanics are somewhat more likely to describe their views as conservative (28%) than liberal (20%), with about half (49%) describing their views as moderate. 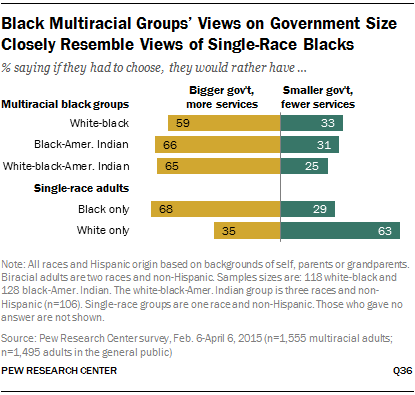 When asked what kind of government they would rather have if they had to choose—a smaller government providing fewer services or a bigger government providing more services—multiracial adults are divided. Half would rather it be smaller, and 46% would rather it be bigger. Among the general public, opinions are similar: 52% prefer a smaller government, and 45% prefer a larger one. Because views about the role of government are closely related to political ideology, the responses among different multiracial groups follow a similar pattern. By a nearly 2-to-1 margin, biracial adults who are white and American Indian are more likely to prefer a smaller government (64%) to a bigger one (34%). These opinions are nearly identical to those of single-race whites (63% vs. 35%). At the same time, multiracial adults with some black background are more likely to prefer a government with more services than a smaller one by a margin of about 2-to-1, and their views line up closely with those of single-race blacks (68% preferring a larger government vs. 29% preferring a smaller one). Black and American Indian biracial adults prefer a larger to a smaller government by a margin of 66%-31%. Among white and black biracial adults, the margin is 59%-33%. And multiracial adults with a white, black and American Indian background prefer a bigger government to a smaller one by a margin of 65%-25%. Biracial adults with a white and Asian background are split between preferences for a smaller (51%) or bigger (49%) government. The views of biracial white and Asian adults fall almost directly between those of the single-race groups that make up their background. 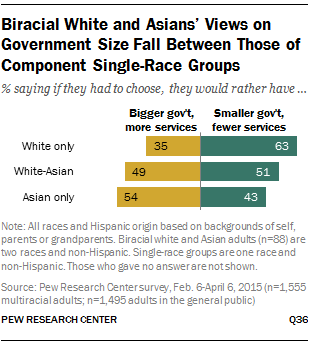 Among single-race Asians, 43% prefer a smaller government and 54% prefer a bigger government. And among single-race white adults, 63% prefer a smaller government and 35% prefer a bigger government. Among multiracial Hispanics, 51% prefer a smaller government and 46% prefer a bigger government. These views are nearly identical to those of multiracial non-Hispanics (50% smaller government and 46% bigger). Multiracial adults are more likely to say government aid to the poor is helpful than harmful: 54% say government aid to the poor “does more good than harm, because people can’t get out of poverty until their basic needs are met,” while 44% say it does “more harm than good, by making people too dependent on government assistance.” Among the general public, the opposite is true (54% more harm vs. 44% more good). 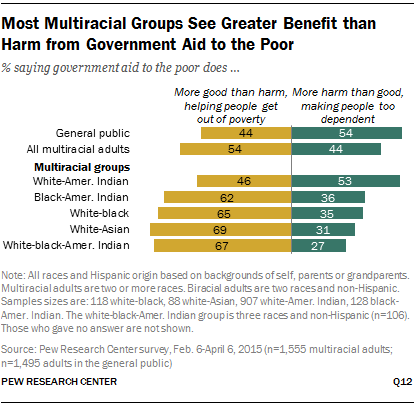 Biracial white and American Indian adults stand out among the other multiracial groups for the high share saying government aid to the poor does more harm than good. Some 53% of biracial white and American Indian adults say this, with 46% saying it does more good than harm, similar to the shares of the general public that express these views. However, biracial white and American Indian adults are somewhat less likely than single-race white adults (59%) to say that government aid does more harm than good. Among the other multiracial subgroups, government aid is consistently seen as doing more good than harm. By a margin of 69%-31%, biracial white and Asian adults say that government aid to the poor does more good than harm. They are more likely than single-race Asians (53%), and especially more likely than single-race whites (40%), to say the effect of government aid is a net benefit. By contrast, the views of biracial white and black adults align closely with the black component of their racial background. An equal 65% of biracial white and black adults and single-race blacks say government aid to the poor has a net positive effect. A much smaller share of single-race whites (40%) agree. The views of the other multiracial groups with some black background also resemble those of single-race blacks. Some 67% of white, black and American Indian multiracial adults and 62% of black and American Indian biracial adults say government aid to the poor does more good than harm by helping people get out of poverty. 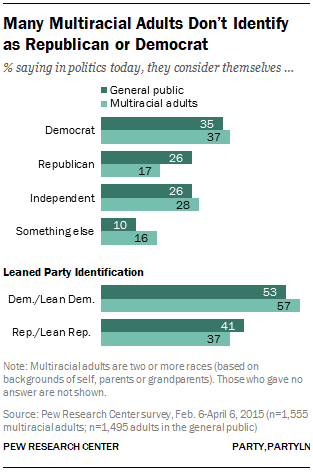 Multiracial adults have different views from the general public on some key policy issues. They are somewhat less likely to favor gun control and more likely to favor marijuana legalization. They do not differ from the general public when it comes to the punishment deemed appropriate for convicted murderers—life in prison versus the death penalty—or whether abortion should be legal. Multiracial adults say, by a margin of 54%-45%, it is more important to protect the right to own guns than to control gun ownership. Among the general public, opinions are more evenly split, with 48% favoring protecting gun ownership and 50% favoring controlling gun ownership. Biracial adults who are white and American Indian are by far the most likely to support protecting the rights of gun owners—seven-in-ten say that this is the more important goal, while just three-in-ten say controlling gun ownership is more important. They are even more likely than single-race white adults (59%) to say protecting gun ownership is more important. 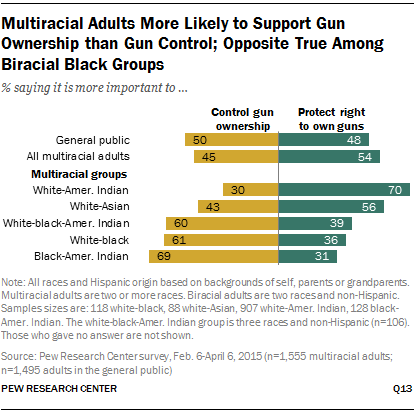 In contrast, biracial adults with some black background are somewhat more likely than the general public to say that gun control is more important—some 69% of black and American Indian biracial adults, 61% of white and black biracial adults and 60% of multiracial white, black and American Indian say this, compared with 50% of the general public. The opinions of these multiracial groups closely mirror those of single-race black adults, who favor gun control over gun rights by a 65%-32% margin. By contrast, single-race white adults are much more likely to favor gun rights than biracial white and black adults and multiracial white, black and American Indian adults. Among biracial adults who are white and Asian, 56% favor protecting gun owners’ rights and 43% favor controlling gun ownership, not significantly different than the opinions among the general public. On this issue, the opinions of biracial white and Asian adults are almost identical to those of single-race whites. White and Asian biracial adults are about twice as likely as single-race Asians (24%) to say protecting gun ownership should be the more important goal. Multiracial Hispanics also do not differ significantly from the general public on this measure—55% favor controlling gun ownership and 45% favor protecting the rights of gun owners. When it comes to the issue of marijuana legalization, multiracial adults as a whole tend to hold more liberal-leaning views than the general public—some 49% of multiracial adults say that the use of marijuana by adults should be legal for medical and personal use, compared with 38% of the general public. A roughly equal share of the general public and multiracial adults approve of legalizing marijuana for medical uses only (36% and 33%, respectively). Adults in the general public are more likely than multiracial adults to say that marijuana use should not be legal at all (24% vs. 17%). The greater support for marijuana legalization among multiracial adults is not only explained by the relative youthfulness of this population compared with the general public. The share of multiracial adults ages 18 to 29 saying marijuana use should be legal for medical and personal use is similar to the share of all adults in that age range who say this (54% and 45%, respectively). However, the larger share of multiracial adults in older age groups that approve of recreational marijuana legalization also contributes to a higher level of support than among the general public. About half (52%) of multiracial adults ages 30 to 64 say that marijuana should be legal for both medical and recreational use, compared with four-in-ten of all adults in this age range. Marijuana legalization is the only political issue analyzed for which white and American Indian biracial adults hold more progressive views than the general public—fully 52% say that marijuana use should be made legal for personal use, compared with 38% of the general public. They are also more likely than single-race whites (41%) to say this. Biracial adults who are white and Asian are also more supportive of legalizing recreational marijuana use than the general public—61% say this should happen. 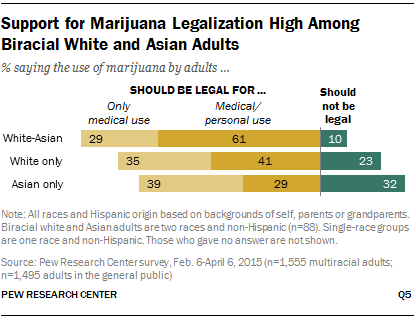 Biracial white and Asian adults are 20 percentage points more likely than single-race whites (41%) and about twice as likely as single-race Asians (29%) to favor legalization of marijuana for personal use. 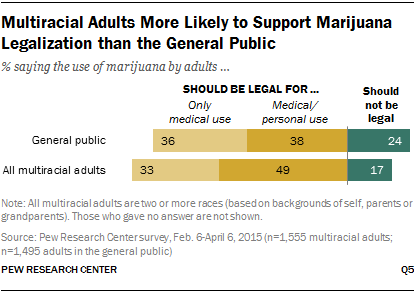 Among other multiracial groups, support for legalization of recreational marijuana use is similar to the support among the general public. Some 49% each of multiracial white, black and American Indian adults and multiracial Hispanic adults, 43% of biracial black and American Indian adults and 42% of biracial white and black adults support legalization of marijuana for personal use. Furthermore, these multiracial subgroups do not differ on this measure from the single-race counterparts that comprise each of their mixed racial backgrounds. Multiracial adults are more likely to say abortion should be legal in all or most cases (54%) than to say it should be illegal in all or most cases (44%). Among the general public, views are similar, though the balance is more even between the share saying it should be legal (51%) and illegal (48%). 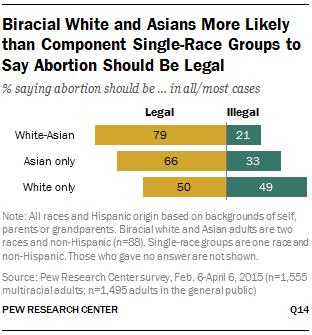 Biracial adults who are white and Asian are particularly likely to favor abortion being legal in all or most cases, with about eight-in-ten (79%) saying this should be the case. Fully 43% of these biracial adults say it should be legal in all cases, which is higher than the share among nearly all multiracial and single-race groups. Comparing the views of white and Asian adults to each of their component races, they are more similar to single-race Asians than single-race whites, although smaller shares of each of the single-race groups say abortion should be legal (66% and 50%, respectively). Other groups of biracial adults are more evenly divided and do not differ significantly on this measure from the general public or the single-race groups that make up their racial backgrounds. Biracial adults who are white and American Indian or black and American Indian hold nearly identical views as the general public—51% of each group say abortion should be legal, while 49% say it should be illegal. Among biracial white and black adults, 60% say it should be legal and 39% say it should be illegal. Some 59% of white, black, and American Indian adults and 51% of multiracial Hispanics say abortion should be legal in all or most cases. 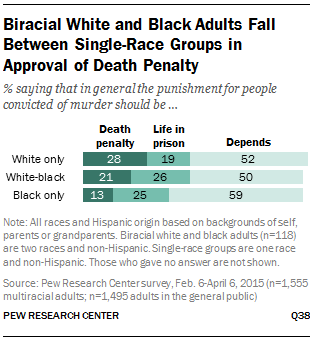 When it comes to the appropriate punishment for people convicted of murder, multiracial adults overall do not differ from the general public in their views—about a quarter (26%) say the death penalty should generally be applied to murder cases, about two-in-ten (19%) say life in prison with no chance of parole is the appropriate punishment, and 54% say it depends on the circumstances. Biracial adults who are white and American Indian are more likely than the general public to see the death penalty as the appropriate punishment for convicted murderers—about a third (32%) prefer this option. This is similar to the share of single-race whites (28%) who say this is the preferred punishment. In contrast, among multiracial subgroups that include both black and American Indian backgrounds, relatively few support the death penalty—just 10% of white, black and American Indian adults and 17% of black and American Indian adults do. Neither of these shares differs significantly from the 13% share of single-race black adults who think the death penalty should generally be the punishment for convicted murderers. Among biracial adults with a white and black background, 21% say the death penalty should be the punishment for people convicted of murder. This falls between the shares of single-race whites (28%) and single-race blacks (13%) who say this. 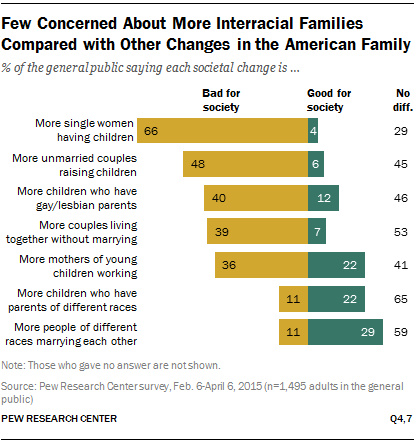 The Pew Research survey included a battery of items about whether a variety of changes in the American family—including increases in interracial families, working mothers, gay or lesbian parents, cohabiting couples, and unmarried couples or single women raising children—have been for the better, worse, or haven’t made much difference for society. Relative to other changes in the American family structure, increases in interracial marriages and parenting are seen as the least harmful, as well as among the most positive. About one-in-ten American adults (11%) see increases in the number of children who have parents of different races as a bad thing for society, while twice as many (22%) see it as a good thing and the majority (65%) don’t see it as an issue either way. By comparison, other changing living situations for children are seen as more negative than positive. For example, two-thirds of Americans (66%) say more single women having children without a partner to help raise them is bad for society; only 4% see it as a positive development. About half of Americans say more unmarried couples raising children (48%) is a bad trend for society, with just 6% saying it is good. And about four-in-ten Americans say more children with gay and lesbian parents (40%) and more mothers of young children working outside the home (36%) are negative developments, while 7% and 22%, respectively, say these are positive developments. When it comes to relationships and marriages, regardless of children, 11% see increases in people of different races marrying each other as bad for society, while 29% say this is good for society. By comparison, a much larger share of American adults see increases in couples living together without marrying as damaging to society (39%), with just 7% saying this is a positive trend. 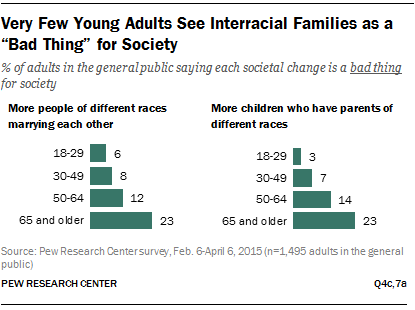 Young adults are at the leading edge of acceptance of interracial families. Americans ages 18 to 29 are significantly less likely than Americans ages 30 and older to say the trends that have led to more interracial marriages and parents are a bad thing for society. Among Americans ages 65 and older, about a quarter see rises in interracial marriages and parenting as bad changes in society (both 23%). It is notable that of the four age groups analyzed, these adults are the only one to have come of age at a time when interracial marriages were outlawed in many parts of the country. These ratings of negativity follow steady slopes downward across the younger age groups. Among adults ages 50 to 64, about half as many say these trends are bad for society than among those older than them. And among adults ages 18 to 29, just 6% say more interracial marriages are a bad thing for society and just 3% say the same about interracial parenting. 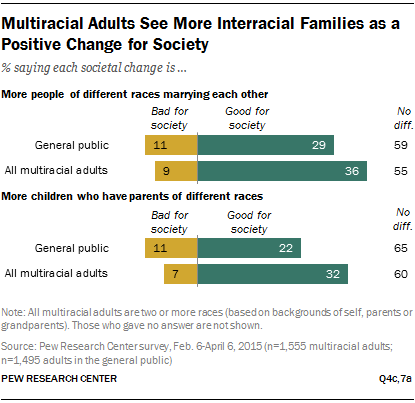 Multiracial adults are somewhat more likely than adults in the general public to see these changes as being good for society as a whole. Some 36% of multiracial adults say more interracial marriages are a good thing for society, compared with 29% of the general public. Similarly, some 32% of multiracial adults say that more children with parents of different races is a good thing, compared with 22% of the general public. Majorities of each group say that these changes in family composition have not made much difference to society, with about one-in-ten saying each of these changes have been bad for society. Young multiracial adults are more likely than those ages 30 and older to say more interracial marriages (49% vs. 31%) and more children with interracial parents (43% vs. 28%) are good for society, while the older group is more likely to say these practices have not made much difference. Among the general public, adults younger than 30 are no more likely than adults ages 30 and older to say that interracial marriages are a good thing for society (33% and 27%, respectively), but they are more likely to see children being raised by parents of different races as contributing to a social good (31% vs. 20%). Biracial white and Asian adults are particularly likely to see these changes as good things for society—60% say more interracial marriages and 54% say more interracial parents are good things for society, standing out from both the general public and several of the other biracial groups in their positive views of this societal shift. Looking at the single-race groups that comprise their multiracial background, white and Asian adults more closely reflect the views of single-race Asians on these issues than single-race whites. These attitudes may reflect the relatively high share of Asians who intermarry. A Pew Research analysis found that about a quarter of Asian newlyweds (28%) were married to someone of a different race or ethnicity in 2010, compared with just 9% of whites, 17% of blacks and 26% of Hispanics. Multiracial adults are more likely than the general public to say that there is “a lot” of discrimination in the United States today against people who are black (41% vs. 26%), Hispanic (26% vs. 18%), American Indian (20% vs. 13%) and white (9% vs. 5%). A relatively low and similar share of multiracial adults and all adults say Asians experience a lot of discrimination (7% and 5%, respectively). Large shares of multiracial subgroups with some black background see discrimination against blacks in the United States. 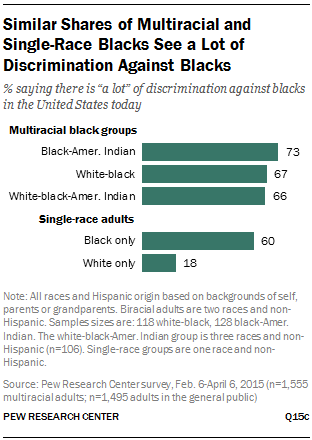 Some 73% of black and American Indian adults, 67% of white and black adults and 66% of white, black and American Indian adults say there is “a lot” of discrimination against blacks. These shares are at least as high as the share of single-race blacks who say this (60%) and much higher than the share of single-race whites who do (18%). Among multiracial subgroups with some American Indian background, black and American Indian adults (33%) and white, black and American Indian adults (35%) are more likely than the general public (13%) to say American Indians face a lot of discrimination. By comparison, biracial white and American Indian adults (16%) are no more likely than the general public to say this. Only 5% of the general public says there is a lot of discrimination against whites in the United States today. Among multiracial subgroups with some white background, those who are white and Asian (16%) and those who are white and American Indian (11%) are more likely than the general public to hold this view. There are no differences in the shares of the general public (5%), biracial white and Asian adults (4%) or single-race Asian adults (9%) saying that Asians face a lot of discrimination in the U.S. today. Similarly, among multiracial Hispanics, perceptions of discrimination toward Hispanics are no higher than among the general public or multiracial non-Hispanics (20%, 18% and 26%, respectively). When it comes to the impact discrimination has on black people specifically, about six-in-ten multiracial adults agree with the statement: “Blacks who can’t get ahead in this country are mostly responsible for their own condition.” A somewhat larger share of adults in the general public (68%) express this opinion. And multiracial adults are somewhat more likely than all adults to take the opposite view: 36% of mixed-race adults say “racial discrimination is the main reason why many black people can’t get ahead these days,” compared with 30% of all adults who say that. 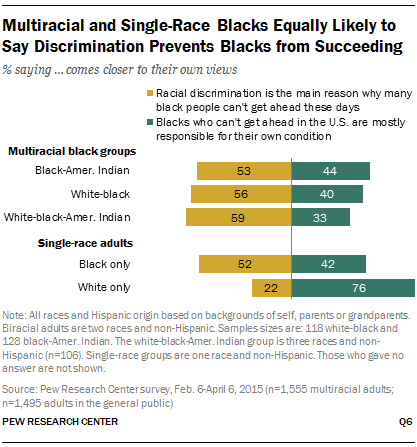 Multiracial adults with a black background are more likely than the general public to say discrimination is the main thing holding many black people back. About half or more multiracial adults who are white, black and American Indian (59%), white and black (56%) and black and American Indian (53%) agree with this statement. The views of these multiracial black groups are similar to those of single-race blacks (52%). By comparison, only 22% of single-race whites say discrimination is the main reason that many black people can’t get ahead these days. Multiracial adults are roughly evenly split on their opinions about the impact of immigrants on the U.S., with 52% saying “immigrants today strengthen our country because of their hard work and talents,” and 45% saying “immigrants today are a burden on our country because they take our jobs, housing and health care.” These shares are identical to those among the general public. Among multiracial adults with some Asian background or some Hispanic background, about two-in-ten are immigrants (21% and 17%, respectively), and their views toward immigrants in the U.S. are largely positive. Some three-quarters of all multiracial Asians, and 67% of biracial white and Asian adults, say immigrants strengthen the country. Multiracial Asians are just as likely as single-race Asians (73%) to say immigrants are a benefit to the country. Among multiracial Hispanics, 60% say this. Just 7% of multiracial adults with some black background and 5% of multiracial adults with some white background are immigrants. Multiracial blacks overall are more likely to say immigrants are a benefit (62%) than a burden (34%), similar to the views of single-race blacks (57% say a benefit vs. 37% say a burden). Among all multiracial whites, opinions are split, with 48% saying immigrants strengthen the country and 50% saying they are a burden. These are similar to the shares among single-race whites, but on balance the single-race group is more likely to see immigrants as a burden to the U.S. (55%) than as a strength (43%).